Our probiotic kefir-based farmer cheese is a healthy, high-protein and versatile ingredient for any recipe, including these crowd favorite sweet crostini appetizers! Satisfy your sweet tooth with a combination of honey, fresh berries, and mint – a flavorful bite that’s guaranteed to delight any appetite. 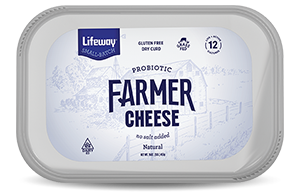 Our Farmer Cheese is strained from our kefir, giving you a spreadable way to enjoy the benefits of probiotics. Probiotics are “good” bacteria. They are live microorganisms similar to the ones already living in your gut and may offer health benefits when consumed in adequate amounts. The word “probiotic” itself is often translated to “beneficial for life.” It is a derived from the Latin word “pro” meaning “for” and the Greek word “biotic” meaning “life.” Probiotics can help balance the microbiome by replenishing the good bacteria, which may lead to improved digestion and better immunity. As research continues to develop, it’s becoming more and more apparent that there is a link between the gut and the brain. What was once suspected as one-way communication (brain to gut) is now understood to be more of a two-way system. Thus, the health of our gut may directly impact the health of our minds. Preheat the oven to 425 degrees. Slice baguette at a 45 degree angle into ½-inch-thick slices. Brush both sides of the bread with olive oil, sprinkle with a dash of salt and bake for 6 minutes, until slightly golden brown. Remove from oven and set aside to cool. In a small bowl, mix farmer cheese with honey and lemon juice until well combined. Set aside. Spread a tablespoon of farmer cheese over warm crostinis and place berries on top. Drizzle with a bit more honey and garnish with mint.